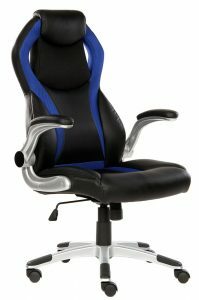 Blue Seatzone BCC003 is a deluxe swivel leather racing type gaming and computer chair for work, study or games, with a streamlined design and lot of support for your head, arm and back. It is a 2017 model popular car seat style chair with a decent rating of 4.5 out of 5 stars as of today. There is also the BCC002-blue model that is a little cheaper due to more plastic parts as compared to the metal on the BCC003. The thickly padded body-hugging back has a streamlined design and the curved shape fits the shape of your lower and upper back offering better support. With the racing type large bucket seat, you can feel comfortable all day long in front of the computer at the office or in your video game room. The non-toxic PU leather on the non-toxic very dense resilience foam feels very comfy and smooth and is very easy to clean as you can wipe it with a damp cloth. And you can feel safe and stable with the solid frame and materials used, SGS approved gas cylinder and 360-degree rotating swivel casters. The chassis is made of nylon 5-star base, super sturdy tray, and hooded nylon casters and has a 26.4-inch diameter. It can carry a maximum user weight of 350 pounds and holds up well to the strains of everyday use. Seatzone Bcc003 weighs 38 pounds as a heavy duty product, the seat measures 20.1 x 20.7 x 4.3 inches and the back is 29.5 x 19.7 x 3.94 inches. Each armrest measures 10.3 x 3.1 x 1.4 inches and the height is adjustable between 45 and 49 inches. The distance between the ground and the seat cushion is 15.3 inches and ground to the armrest is 28 inches. It is suitable for people of different sizes, so very tall and large people will also be generally OK: People between the heights of 5’5” and 6’3” and 180 lb. to 350 lb. Please check the measurements and ask the seller through the Amazon product page if you have any question marks in your head. By also adjusting the knob below the seat you can rock the chair back and forth. You won’t be likely to experience any hip or back pain because of sitting all day long as your back and lower section will feel like being massaged while sitting. It is comfortable enough to let you take a nap during your breaks or when you feel tired and sleepy. It moves fine on hard surface or carpet but you may want to use a plastic pad if putting on a thick carpet. When you move the chair or rotate it in any direction it will not make any noise or damage your floor. Please note that you can’t remove the arms without taking the whole chair apart but they can flip up. It will be shipped unassembled but you can easily put it together, in just a quarter of an hour. The white gloves, as well as the simple tools, are included for those that don’t want to get oil from the gas cylinder. The company offers good customer support and care about your satisfaction and you can contact them in case of any problems. 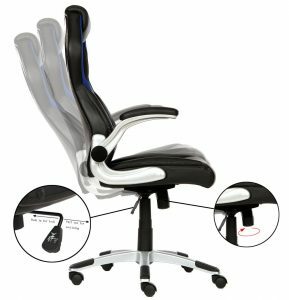 Seatzone Gaming Chair is easy on the eyes, very comfortable, has an ergonomic design, built with solid and good quality materials and offers good value for money- cheaper than some of the similar brands.